Because of the hands on nature of this class, it is limited to 12 people only. You do NOT need to have a valid ham radio license to attend. Just bring your radio with you. Those without a license just won’t be allowed to actually transmit throughout the class. If you have your license, but are unsure of how to properly use your radios, check out this class. 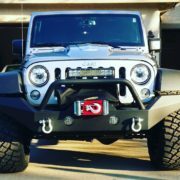 Forged Offroad will also be doing a tour of their facility and a little show and tell about what they do. Event and registration info below. 1 day ham cram class. FCC license exam at the end of the day. 1 Stop Shop. $30.00 for the class. $180.00 for class and 100 channels pre programmed Alinco radio. This class will be limited to 25 people. 2 weekends in November. I believe they are planning on Nov 3rd, and then Nov 16th. It is free of charge. I believe they charge $120-130 for a Yaesu handheld programmed with the 6 Rubicon frequencies. Their website is currently down, I will try and get ahold of John Arenz to get exact dates for everyone. Ham cram is same day as toy run! No way I miss that. Christmas spirit always flowing in old fat dudes! Is there another or would it be better to take the two weekends in November? Dec 2nd is a Sunday. I believe the toy drive is on a saturday… I could be wrong though. I will be doing another class in January at Powertank. That one should be a lot of fun. The Powertank guys are awesome and we will get a fun tour of their facilities. Oops! My bad, being retired, I am calendar-challenged! I appreciate the help and will now go sign up.